I don’t know about you, but when it comes to changing a baby in public – the last thing I care to do is take my kid to the bathroom to change him. I get grossed out, so easily – the thought makes me GAG! 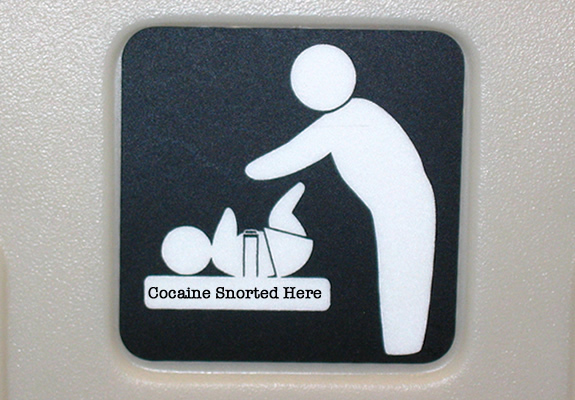 When I read about how 92% of changing tables in the UK were found to have cocaine on them… 2 thoughts. I don’t care if it’s the UK or USA – those tables disgust me! WHAT No Public Changing Table? So what do I do when the little pooper poops or pees? I change him in my car. We always carry a back-up diaper bag, that is stashed in the back of the car. We use this as our make-shift changing station. I would much rather my car have a little poo in the back than putting my kid anywhere near the nasty of a changing table! Sure I could use liners, or what you – but still too close for comfort. 4 months into Zeke’s life and no public changing tables for him!